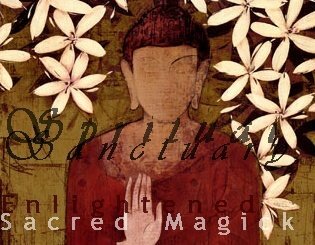 As humanity evolved along the path of spirituality, various aspects and attributes of divinity were sensed. Climbing higher on the scale of the holy path, Man discovered more facets of Allah, or whatever one may call the Absolute. Gradually, the hidden unveiled, and is still unveiling the many qualities, and depth of beauty, Truth, layers of consciousness awaken to the multi faceted realities of each quality. This revelation is an on-going process, for humanity will not cease to struggle for enlightenment. Discovering himself, man discovered God; and the more he grew in self-awareness, the more he discovered the treasures, the various divine elements unawakened within his essence. This was how the various names of God came into existence. Primitive cultures might have referred to the unseen Intelligence with a single appellation, but as they grew in maturity, in awareness, wisdom and understanding, as they unfolded their own innate divinity, more attributes were realized and names were assigned to the God they worshipped, for man inherently felt that the awakened virtues he had are possessed in full perfection by the Source of All. The amount of God-names expands as man develops his Spirit-awareness. What man formally understood broadly, he now began to perceive the details, the minor rays of the One Light; and these details, he may subsequently discover, further differentiate themselves ad infinitum. thus humanity still needs to grow into God's image and attain its own beautification, acquiring the state of perfection, the evolutionary stage called "Insan Kamil," or "Perfect (whole) Human Being." 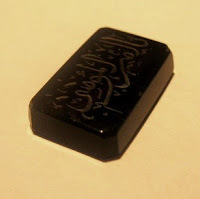 These Talismen are magickally empowered to bring a specific Divine Name of Allah into the essence and being of the wearer, he will fine tune this particular quality within himself and attain the divine essence of its meaning. One of the teachings of Islam is that angels do not descend into houses filled with dogs and images. Though fundamentalists may adhere to the rule of the letter, esoterically, this refers to the unrestrained desires and the idols of the mind. The Divine Ray of the Holy Spirit has trouble entering man through the crown chakra blocked with psychic toxins generated by the impure mind and emotions. This is the esoteric interpretation of Christ knocking at the door and waiting for entry. He who would not purify himself causes the portal to remain barred. The Divine Names in Islam that have traditionally been passed on to us are 99 in number; the word "Allah" rounds the number to 100. The "Beautiful Divine Names" is probably the development of the 72 divine names of the Schemhamphoras, the 10 God-Names of the Qaballistic Tree of Life, and the other numerous appellations of God to be found in Jewish scriptures. The names are archetypal and will be experienced as realities within the recesses of one's psyche. Each letter of the Arabic alphabet (Abjad) has a numerological value and is associated with khodams, or angelic servants. The letters are embodiments or are representative of cosmic energies. The combined letters forming the Divine Names are in turn associated with other spirit khodams or classes of the angelic hierarchy. Having numerical values, the combined letters of the Divine Names represent metaphysical structures mathematically-based that possesses esoteric significances. Practitioners chant the Names the number of times in accord with its total value. The numerical value of a Name resonates with the power that it represents. Thus chanting the value of a Name or one of its expression mathematically derived therefrom, invokes the power, grace and virtues of the Name into the magician's consciousness. . The khodam familiars assigned to the Divine Names actually represent an angelic class rather than to specific individual spirits, different angels are assigned to the Divine Names. The angels of the Divine Names may be known through direct experience. In the occult practices of Ilmu Hikmah, the beautiful appellations of Allah are recited for thousands of times per day, sometimes for consecutive months in order to evoke the khodams to "material" appearance. The purpose of the evocation are varied. The angelic servers may be called upon to assist the practitioner in solving the varied problems of life; to provide familiars, to acquire occult powers and abilities, mystical objects, general information and magickal knowledge; to assist in magickal operations, etc. With these Talismen, you are connected to the angelic khodam assigned to the name that is inscribed in the dark carnelian stone, it has been empowered and will activate this divine quality like a spark of fire in your soul, the angels can be summoned when repeating the name daily. You can call upon them for assistance in occult practices and energywork.